Mr. Simpleton is in town. Well, actually, you can find him in different towns and cities since he’s travelling. His agenda is to check out some of the most unique Indian buildings in terms of design. The impression that seeing these buildings made on him may be simplistic but not without matter. Why don’t to see for yourself? This is the biggest L&T complex in Chennai. I see this main building and I get this protective urge like a mother would for its child. Okay, that’s a bit too much, I know, but I do feel protective seeing how the building looks like a kid trying to take its first step. So, I feel like stepping forward and taking it in my arms, just in case…The building has a total of eleven floors including 3 basement level floors. My late Grandfather used to tell us stories from the Puranas when we were kids. About the “Cosmic Egg” from which everything came. This building certainly reminds me of the egg, and it brings back memories of my granddad. The fact that Infosys buildings are green building meant to impact the environment in the least possible way makes it even more poignant since grand father also was a great nature lover. Oh, God, I can hear his voice now, I think I’m gonna cry! Man, I’ll be candid, I’m getting a little dizzy looking at that building. But they say it comfortably houses over 1, 500 employees; so it mustn’t be as perilous as it looks from the outside. The floor area is more than 144, 000 square feet and it makes us of the natural light to the utmost, thereby promoting energy conservation. And oh, if you wanna come check it out, this is at Bagmane Tech Park, which is a software technological park in Sir C V Raman Nagar. Hey, now this is cool! It’s like a real life version of a 2D animation. Not that the structure itself is 2D but it has that old-school charm of simple graphics-blinking lines and cute colour streaks-that I quite dig. This is situated in the Airtel Technology Park in Delhi NCR. Maybe I should have bought my old Atari with me! It’s called Engineering Research and Design Centre. Well, I’d say they got the Design part correct all right. Looking at it takes me right back to my childhood when I used to believe that with patience, it’s possible to stack anything one on top of the other-anything. This building in Manapakkam is ‘intelligent’ in that things like life-safety systems, energy management systems and telecommunications systems are all fully automated. This is one edifice I’ve always wanted to see for myself. 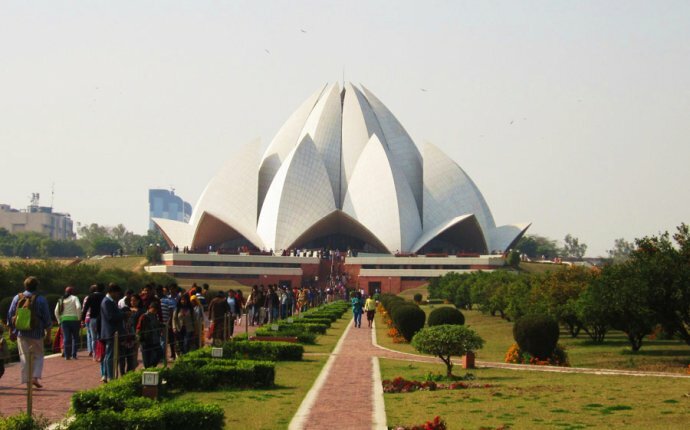 This flower-like structure is world famous. Just in case you didn’t know, this is a Baha’i House of Worship. I heard that the temple has won a whole lot of architectural awards, but I’m not surprised seeing how elegantly it is designed. Already famed as one of the best designed office buildings in India, the Signature Towers is situated on the National Highway 8. You’ll find many leaning companies working out of this building. And yes, it does remind me of lego bricks. I heard that the buildings here conform to the norms of Vaastu Shastra. These supposedly have some awesome technologies that help create an energy conserving and healthy environment. And the buildings in this IT Park vary in floor area from 60, 000 sq.ft to 150, 000 sq.ft. But talking about IT parks, I’ve always wondered about one thing-don’t you ever feel bored working so mechanically all the time? This is the national editorial house of the newspaper, ‘The Statesman.’ To be honest I’ve never read ‘The Statesman’ ever but I’m mighty impressed by this building of theirs. If their news-reporting is nearly as interesting as this, then they have a subscriber in me! I’ve always wanted to see this place. India’s first luxury mall. The project, spread on 13 acres, has buildings looming up from the ground that look like something out of a tale of alternate history. Set in a world where things are always bright and there’s no misery. The Geodesic dome in Auroville is covered by golden discs that reflects light. This is the reason for its radiance. And inside the dome is a meditation hall. This is actually the world’s largest optically-perfect glass globe. I never meditate, tried it a couple of times when I was preparing for some bank tests and was under severe pressure. But somehow, I couldn’t find the patience to sit still and do nothing. Strange, our greatest ambition at many points in time is to sit and do nothing and yet, when we get the opportunity, we ‘re too lazy to do that. 1.3 million sq.ft. If that’s not enough to make your jaw drop, you should come take a look at this building with your own eyes(without the interface of a screen) and you can enjoy the brilliant design incorporating stones, metal and glass, realized by none other than the great architect Hafeez Contractor. What! You didn’t know who Hafeez Contractor is? Man, come on, where have you been living?! Just kidding. Even I have never heard of his name prior to checking out who designed this marvellous building. It is believed that home improvements have to be complicated and expensive. The truth is that home improvements are not limited to what you can see on TV. You can do a lot of DIY things to improve your home. Those things do not require a lot of time or a lot of money. All you have to do is to use your creativity and combine it with a little bit of hard work and you will get what you need. Sometimes it can be hard to figure out what improvements will be best for your home. Nevertheless, there are numerous DIY ideas that will help you.